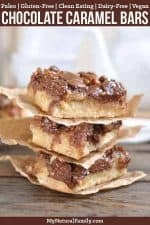 These Paleo pecan pie bars have a light, thick crust and are topped with a simple caramel sauce and chocolate chips. You’ll love the contrast of the crust texture with the crunchy, yet gooey topping texture. These are definitely crave-able! Sometimes in the food blogging world, you hit the jackpot with a new recipe…and that is exactly what I did with this one, definitely one of my proudest moments (forget graduation, getting married, having kids, etc – – haha :). Okay okay, I am obviously exaggerating, but seriously only a little bit. 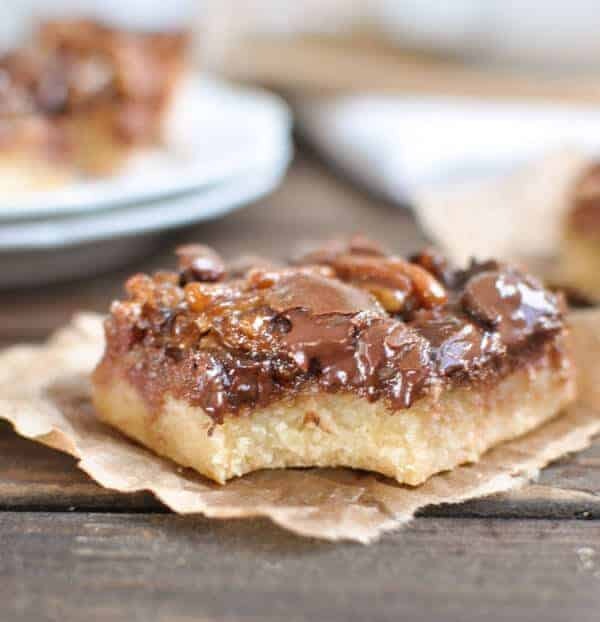 These bars are GOOD and addictive, and decadent, and indulgent, and everything you could possibly want from a dessert – plus more. 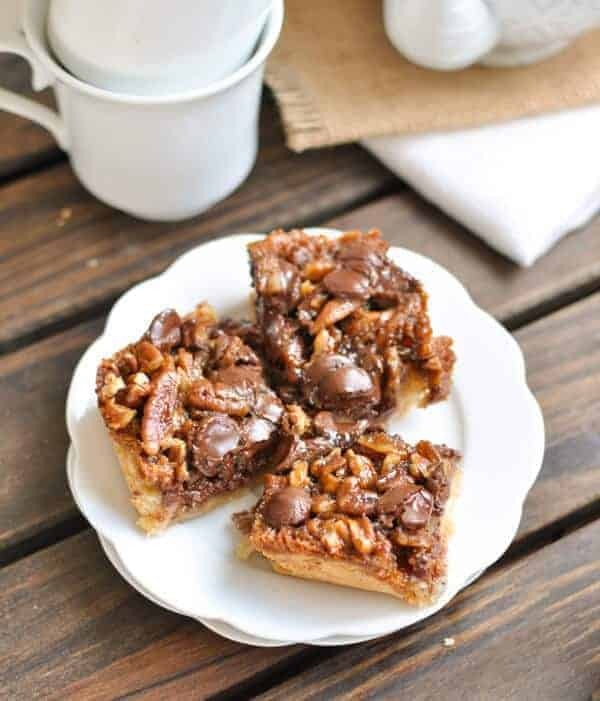 If you are a naysayer and think that you can’t make a decadent dessert without using refined flour, sugar, and eggs, I double dare you to make these and try them. I can pretty much guarantee you will be converted to my side :)! If you are like me and already believe that simple, whole foods can be every bit as decadent as traditional desserts than you are in for a treat today. 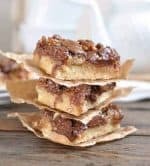 These chocolate caramel Paleo pecan pie bars are insanely delicious (have I mentioned that yet), grain free, gluten free, dairy free, made with natural sweeteners, and Vegan! Yes, it is too good to be true, but I assure you it is – sometimes you can get the best of both worlds. Watch the caramel carefully, cause it will seem like it’s taking forever and it will never caramelize and this is really boring and I think I’m going to do something else and then all of a sudden it’s – I only left for a minute and now it’s burnt! If you serve it when it’s too warm, it will fall apart, but it’s so good when it’s warm. So good. The best compromise is to serve them when they are still slightly warm and not cold, but not so warm that they just fall apart. As for coconut cream, you can either take a can of coconut milk and refrigerate it overnight, then the next day, don’t tip it over. Just open it up and carefully skim the thick cream off the top. Or, you can buy cans of just the coconut cream. I would love to know if you try my recipe and what you think of it and what occasion you made it for. Please comment below! Making for the second time today. Delicious! One of my favorite recipes. Oh, good! I’m so glad you like them! Thanks for commenting. 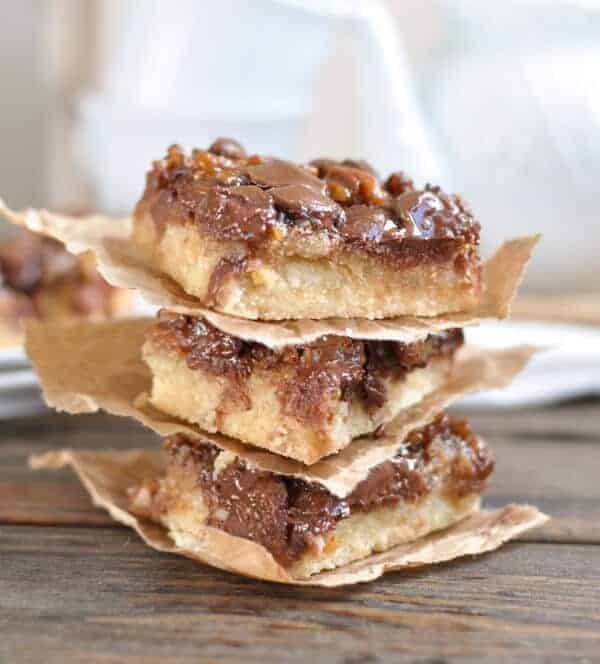 These bars look absolutely divine. I have got to try them.